Gaspar Melchor de Jovellanos (5 January, 1744 - 27 November, 1811) was a Spanish neoclassical statesman, writer and philosopher. 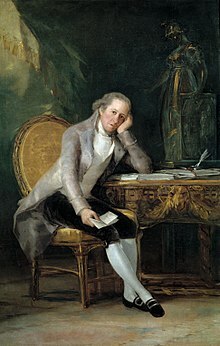 Involved in the disgrace of his friend, Francisco de Cabarrús, Jovellanos spent the years 1790 to 1797 in a sort of prison at Gijon where he wrote. In 1797 he came back and refused the post of ambassador to Russia, but accepted to become minister of grace and justice. Joseph Bonaparte, on mounting the Spanish throne, made Jovellanos lots of offers but he refused them all and joined a patriotic party. When he was involved in the fall of the party he was sent back to Gijon. The vessel in which he sailed was compelled by stress of weather to put in at Vega de Navia (now Puerto de Vega) in Asturias, and there he died on November 27 1811. This page was last changed on 18 January 2017, at 11:28.